The High Energy Gamma Ray Gas Cerenkov Telescope was born as a initiative of the Laboratory of Nuclear Studies at Cornell University in late 60's. That group started the project taking account that the detection of gamma rays from spatial sources is specially complicated due to several factors: the very low flux values to be obtained, the presence of a diffuse background of these rays coming from all directions, and a much larger background flux of charged particles. Therefore, the basic premises for a good detector required a combination of large detection area, long exposure time, high efficiency, good angular resolution, excellent background rejection, and simple data recording. With all this in mind the Cornell group started the development of a instrument that used a large tube filled with an appropriate gas, capped at one end by a scintillator-lead-scintillator sandwich and at the other by a scintillator and a mirror that focused the Cerenkov light on a small array of photomultiplier tubes. First steps were carried with support from the Air Force Office of Scientific Research (AFOSR) while temporary collaboration was arranged with the Smithsonian Astrophysical Observatory, who designed the orientation system. 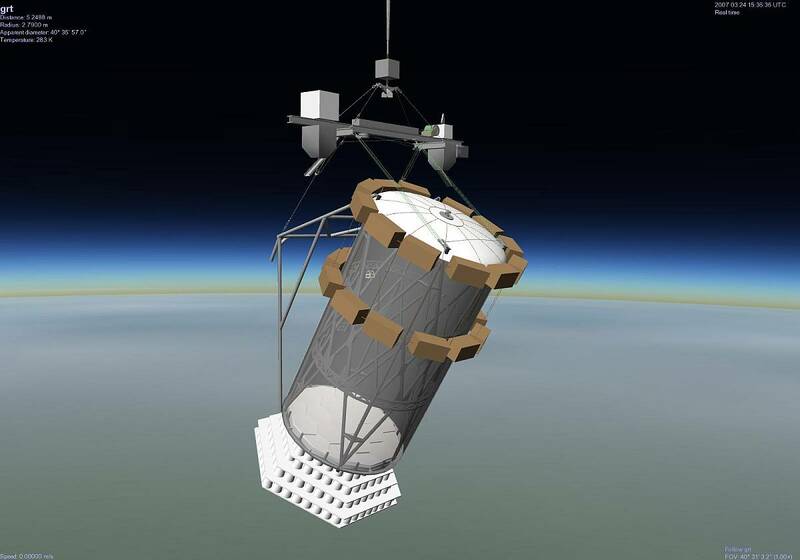 In November, 1970, AFOSR retired from the project for lack of military relevancy, but at the same time NASA started its involvement on it providing the neccesary grants to complete the instrument development and to perform the balloon flights. The instrument was formed by a big cilinder measuring 100 inches of diameter and 200 inches of longitude. As one single mirror of such diameter was at the time difficult to handle and costly to manufacture, the telescope mirror was constructed from 19 hexagons coated with aluminum and cut on the outer edge to match the shape of the 12 sided scintillator array. The mechanical structure consisted of two molded fiberglas heads joined to a neoprene lined, fiberglas cloth bag by means of two bolt rings. The neoprene, provided a light tight, gas tight bag as well the fiberglas heads which was also lined with neoprene. The aluminum space frame shown in the scheme above connected the two heads. This framework fixed the phototubes at the focus of the mirror and relieved the longitudinal forces on the bag when it was pressurized. Two aluminum honeycomb pallets were coupled to the heads and the space frame supporting the scintillators, lead, mirror, and electronics. To facilitate the emission of Cerenkov radiation by the particles that traversed the telescope, the interior of the cilinder was filled with an equal mixture of Freon-12 gas and air. A system consisting of several switches and a large poppet valve, allowed the regulation of the pressure while the balloon ascended until it reached the optimal value of 1.6 psia at float altitude. The three scintillators, S1, S2 and S3 were each divided into 12 symmetrical sectors one quarter inch thick and viewed from the outermost edge by a phototube through a light pipe made from eight strips of plexiglass. The Cerenkov detector was composed by a five-inch Bi-Alkali photomultiplier tube, while to collect the light at the mirror focus seven phototubes with light funnels of eight inch diameter were used. An advantage of this detector was that because of its size, time delayed coincidences were be used to reject particles traveling in the wrong direction. The fast electronics required for this were constructed from MCEL logic cards. The outputs from the Sl, S2, S3 and Cerenkov phototubes were separately mixed by linear fan-ins. The multiplexer consisted basically of six sixteen pole switches. The information from each event, along with time parameters and housekeeping data, were recorded on a seven track digital magnetic tape recorder, and were also telemetered to ground. The orientation system, permited to control the zenith angle of the telescope from the ground by commanding the drawing of a wire rope over a capstan. The desired angle was obtained by seting the offset of a magnetometer with respect to the lift bar on which it was mounted. Also the whole payload rotated through a thrust bearing, turning against a multifilar suspension and the inertia of the balloon, until the offset magnetometer achieved a null reading. Supplementary orientation information was provided by other magnetometers, a shaft encoder attached to the axis of a pendulum, a sun-seeker, and by a camera oriented along the telescope axis to photograph the brighter stars. 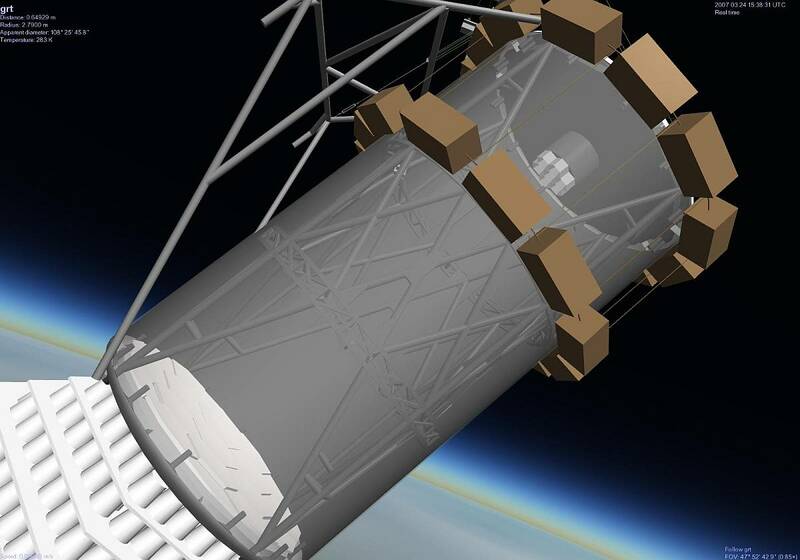 The external estructure of the instrument was protected by two crush pad systems: one formed by several layers of styrofoam cups placed under the bottom head and the other consisting of two rings of cardboard honeycomb placed around the outside near the top. This allowed to protect the instrument at landing even if the telescope toppled over. 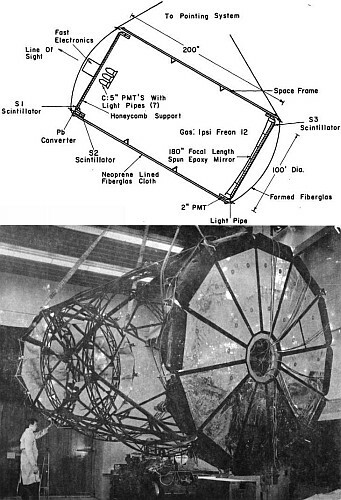 The weight of the telescope, without crush pad and pointing-system, was 2.600 lbs and the total weight of the scientific package was 3.400 lbs. The balloon was launched by dynamic method on 22 July l974 at l2:45 utc. As expected during the ascent, the valve that closes the Cerenkov gas bag at the operating pressure of l.5 psi closed at the preset, precalibrated altitude (~50.000 ft.). The package reached a float depth about 1l9.000 ft. at l5:15 utc. The main observational target -the NP0532 pulsar in the Crab Nebula- was available to the axis of the telescope as early as l3:25 utc but due to the late hour of the launch that observational opportunity was lost. Also, when the pointing system was tried, before float was achieved, it was discovered that the zenith system had frozen entirely. It was thought that moisture in the pulley system had frozen, and it was hoped that exposure to sunlight would free the cables. Gondola power was turned on at l5:23 utc and the zenith system started to operate at l5:58 utc. The telescope was in position by l6:05 utc, just in time to catch the transit of the Crab two minutes later. The Crab was available to the telescope axis until l8:52 utc and was in the aperture until about l9:15 utc. Shortly after the Crab went out of the zenith range of the pointing system, the balloon went out of range of the Palestine telemetry station. Although the downrange station at Midland, Texas, was operational, the analog tapes from the remainder of the flight were not digitized and the PCM record from downrange turned out to be unreadable. Due to this, the planned attempt to observe the galaxy M87 was not successful. The only other possible source viewed was the site of the recurrent transient X-ray source A0535+26, located 4° from the Crab. A period analysis using the l04 second period of that source showed a null result. At the end of the flight, the telescope was safely parachuted to the ground near Van Horn, Texas. This was the sixth and last flight of the instrument. From post flight examination of the data it was found that gamma-ray flux from the source had returned to 1971 values.